Registration deadline is March 20, 2019. Do more with your race. Be a Hero, and run for the kids of St. Jude. Over 24,000 athletes from all 50 states and more than 63 countries will set out from Dodger Stadium to accomplish a personal dream by reaching the Finish Line in Santa Monica. 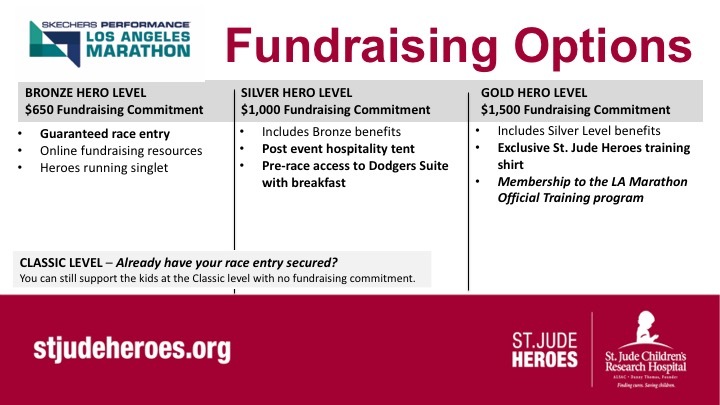 As a St. Jude Hero, you'll raise funds for the kids of St. Jude while you train for your race. The dollars that Heroes raise help ensure that families never receive a bill from St. Jude for treatment, travel, housing or food — because all a family should worry about is helping their child live. Registering as a St. Jude Hero does not guarantee your entry to this event. All Heroes must complete a fundraising commitment form to secure a race entry. A St. Jude representative will contact you regarding your commitment. If you have questions or would like more information, please email ryanne.tejeda@stjude.org, or call 213.215.2679.